The 1/4 in. x 1/2 in. Shark Bite Push-to-Connect x FNPT Adapter allows you to make a connection to 1/4 in. PEX pipe using a Push-to-Connect connection and then gives you a 1/2 in. Female NPT Adapter on the opposite end. Shark Bite fittings are the easiest way to join copper, CPVC or PEX pipe in any combination with no soldering, clamps, unions or glue. Just insert the pipe and the stainless steel teeth bite down and grip tight, while a specially formulated O-ring compresses to create a perfect seal. Disassembly is just as fast using the simple disconnect tool so fittings and valves can be easily changed and reused. They can even be rotated after assembly for easier installation in tight spaces. Shark Bite Fittings are certified for potable water supply and hydronic heating applications. Get Shark Bite and get a grip on your next plumbing project. SharkBite 18 in. Water Heater Connector - 3/4 in. The SharkBite 18 in. 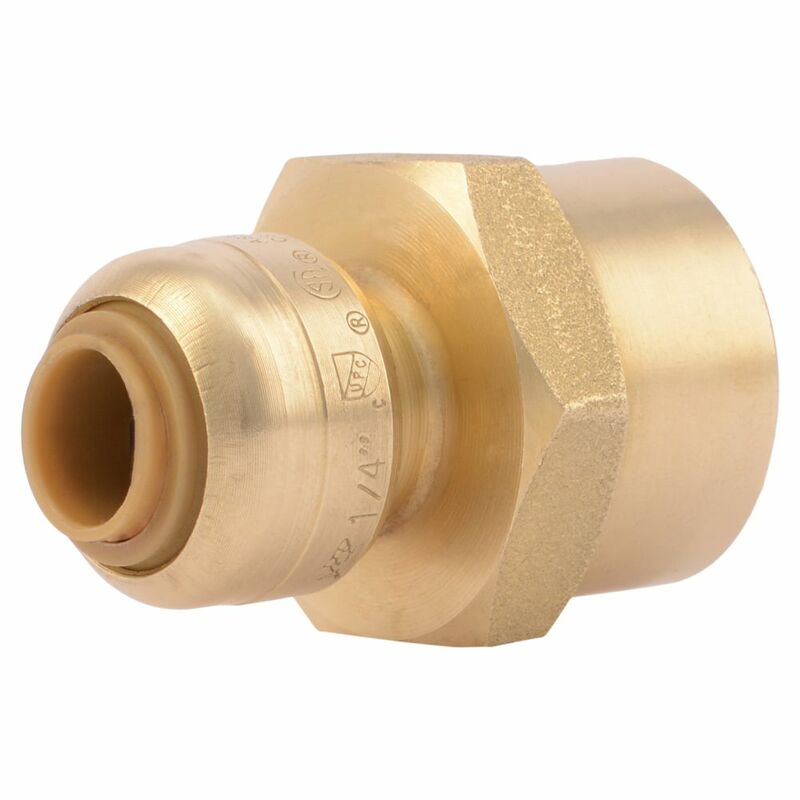 Lead-Free Brass Water Heater Connector helps you quickly and easily join PEX, copper or CPVC tubing (not included) in your water heater. The connector features de-zincification resistant brass construction and a stainless-steel finish. Sb Connector 1/4 Inch X 1/2 Inch Fnpt Rt Lf The 1/4 in. x 1/2 in. Shark Bite Push-to-Connect x FNPT Adapter allows you to make a connection to 1/4 in. PEX pipe using a Push-to-Connect connection and then gives you a 1/2 in. Female NPT Adapter on the opposite end. Shark Bite fittings are the easiest way to join copper, CPVC or PEX pipe in any combination with no soldering, clamps, unions or glue. Just insert the pipe and the stainless steel teeth bite down and grip tight, while a specially formulated O-ring compresses to create a perfect seal. Disassembly is just as fast using the simple disconnect tool so fittings and valves can be easily changed and reused. They can even be rotated after assembly for easier installation in tight spaces. Shark Bite Fittings are certified for potable water supply and hydronic heating applications. Get Shark Bite and get a grip on your next plumbing project. Sb Connector 1/4 Inch X 1/2 Inch Fnpt Rt Lf is rated 3.0 out of 5 by 1.